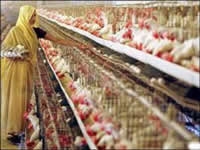 A broiler is a type of chicken raised specifically for meat production. Modern commercial broilers, typically known as Cornish crosses or Cornish-Rocks are specially bred for large scale, efficient meat production and grow much faster than egg or traditional dual purpose breeds. They are noted for having very fast growth rates, a high feed conversion ratio, and low levels of activity. Broilers often reach a harvest weight of 4-5 pounds dressed in only five weeks. They have white feathers and yellowish skin. This cross is also favorable for meat production because it lacks the typical "hair" which many breeds have that necessitates singeing after plucking.